Rajasthan Tribal tour is planned to let you explore the most unexplored areas of Rajasthan’s multi ethnic spirit. During the tour explore parts of Rajasthan that have still managed to retain its old charms and the age old practices. On this tour you get a wonderful opportunity to interact with some of the colorful tribes like the Bishnoi's, Bhils, Nauls and many more, bringing you very close to an enchanting culture that is replete with tales of honor, pride and love. Visit the major tourist attractions of Delhi including Qutub Minar, Red Fort, Humayun’s Tomb, Lotus temple, Raj Ghat, India Gate, Parliament house and the Rashtrapati Bhavan. Sightseeing tour to the major tourist attractions of Nawalgarh include Nawalgarh Fort, Roop Niwas Palace, Anandi Lal Podar Haveli and the Sheesh Mahal. Guided tour to the major tourist attractions of Devigarh covering Bapparawal Lake, Eklingji temple complex and Nathdwara. Visit the major tourist attractions of Karauli including Bhanwar Vilas Palace, Karauli City Palace, Kaila Devi National Park and the Timangarh Fort. After reaching Delhi airport, meet our representative who'll arrange a smooth transfer to one of our listed hotels. Check-in at the hotel to relax in your comfortable room. After straightening your backs for a while, head to a city tour of Delhi. Major tourist attractions scheduled for the day trip include the Qutub Minar, Red Fort, Humayun's Tomb – all three of them are UNESCO World Heritage Sites. 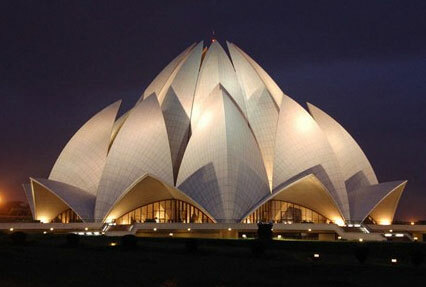 Get ready to soak in the tranquility at the Lotus Temple, Raj Ghat and India Gate. Get insights about the political proceedings at the Parliament House and the Rashtrapati Bhavan. In the morning after breakfast, drive to Samode. The Samode village is one of the gateways to Shekhawati region. The village is known for its beautiful palace and gardens. On reaching, check-in at one of our listed hotels. Relax for a while and thereafter move out to explore the picturesque village where the rural life includes agriculture and cattle farming. While exploring Samode also get introduced to crafts and the craftsmen of the village. Enjoy a matchless experience of rural life and age-old cultures. Return to the hotel in the evening to enjoy the legendary Rajasthani hospitality and a scrumptious dinner. Overnight stay is planned at the hotel. In the morning drive to Nawalgarh, the golden city of Rajasthan. The place is famous for its havelis and frescoes. Upon arrival, check-in at one of our listed hotels. After taking some rest, proceed for Nawalgarh sightseeing and meet the Naul tribe of this region. Have a closer look at their tribal lifestyle. The town is so fascinating that it has featured in many movies. Major tourist attractions of Nawalgarh include Nawalgarh Fort which has a great collection of fascinating frescos, Roop Niwas Palace which is famous for beautiful fountains and lush gardens and Anandi Lal Podar Haveli – a mansion that flaunts amazing frescos with interesting themes. Another must-visit place in Nawalgarh is the Sheesh Mahal that showcases the artistic brilliance of the Rajputana craftsmen. Day 4 of the Rajasthan Tribal tour starts with delicious breakfast. Subsequently, drive straight to Khimsar. It is a small village situated on the highway from Jodhpur to Bikaner. Post reaching, check-in at a pre-decided hotel. Unwind for a while and get ready for a guided tour to Khimsar. While exploring this deserted town get acquainted with the rural life of the aboriginals. During the day, visit the Khimsar Fort, a formidable construction which was meant for the use by the royal women. The striking beauty of the fort has helped it to be converted into a heritage hotel. In the evening, you may enjoy a camel safari or jeep safari to the Khimsar Dunes Village. The small area boasts of eco-friendly huts. You will be impressed by its rural charm. On day 5, savor a hearty breakfast and enjoy a road trip to Jaisalmer. The city is famous for its folk dances and music that has been appreciated all over the world. After reaching the town, you will be transferred to one of our listed hotels. Post completing the check-in formalities, relax for a while. Later on, step out to visit the Jaisalmer Fort. 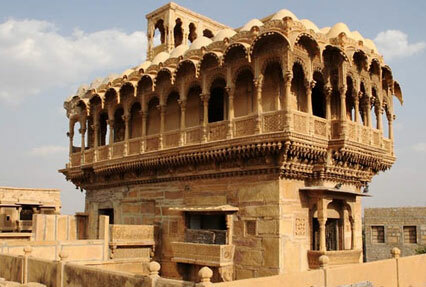 The fort was commissioned by Rajput ruler Jaisal and is situated on the Trikuta hill. Rest of the day is scheduled for visiting the Patwon-ki-Haveli and Nathmalji-ki-Haveli. Dating back to 19th century, the Patwon-ki-Haveli has been transformed into a museum and features splendid artwork, intricate carvings and amazing furniture. Nathmal Ji Ki haveli beguiles the visitors not only with its grandeur and architecture but also with an interesting legend associated with its construction. In the evening, return to the hotel for dinner and an overnight stay. Post breakfast, drive towards Pokhran. It is a peaceful town that serves as an ideal spot for a relaxed and unhurried vacation. As you reach your desired destination, get accommodated at one of our listed hotels. Straighten your back for a while. In the afternoon, set out on a sightseeing tour of Pokhran. The major tourist attractions of the town are Fort Pokhran which stands gloriously amidst the Thar Desert, Pokhran Museum – a small museum within the fort flaunting the collection of paintings, weapons, costumes of royal families etc. Other popular attraction is the Baba Ramdev temple. Return to the hotel for having a scrumptious dinner and an overnight stay. Start the day by driving straight to the Jodhpur. The ‘Blue City’ is located on the foothill of a sandstone hillock and seems like an oasis in the vast desert. The major tourist attractions of Jodhpur include- Mehrangarh Fort which rises above the city and is known as the largest forts in India, Umaid Bhavan Palace, one of the last grand palaces to be built in the country where the royal family still dwells in and the Jaswant Thada, the royal cenotaph made up of white marble that commemorates Maharaja Jaswant Singh. Enjoy dinner and overnight stay in the hotel. In the morning, after having your breakfast embark on an excursion to Mandore. The place is known for its beautiful gardens, sceneries and is largely inhabited by monkeys. The major tourist attractions of Mandore are the Hall of Heroes, commemorating famous Rajput folk heroes and the Mandore Gardens, famous for its cenotaphs and fascinating sculptures of the Hindu deities. After the visit, drive to Rohet. Upon arrival, check-in at the pre-decided hotel. Subsequently, set out to enjoy a village safari to meet villagers and to observe their way of living. Marvel at the art and craft forms they preserve from close quarters. In the afternoon you may enjoy a jeep safari tour to Rabari and Bishnoi tribal villages. Retire for the night in the hotel. Day 9 of the amazing tour begins with a hearty breakfast. Post this, drive to Daspan village where the fertile fields grow bountiful crops. The village is also known for its embroidered shoes and a heritage hotel. On reaching Daspan, check-in at one of our listed hotels. Rest of the day is reserved to explore the village and meet the families that make bows and arrows in the Bhil style. Satiate your hunger with a hearty breakfast. Continue your journey of the tribal tour by covering the next destination of the tour which is Siana. Bordering the great Thar Desert, Siana is a small hamlet offering complete insights into the traditional way of life. The unexplored village is an ideal place for adventure lovers seeking for some thrill in the form of safaris. When here, don’t miss to observe life at a farmhouse. After breakfast, drive to the Sirohi. It is a village bordered by Jalore in the west, Pali in the north, Udaipur in the east and the state of Gujarat in the south. Thus, the town showcases a perfect confluence of Mewar, Marwar and Gujarat. Once here, complete the check-in formalities at the hotel and be prepared for a guided tour of Sirohi. 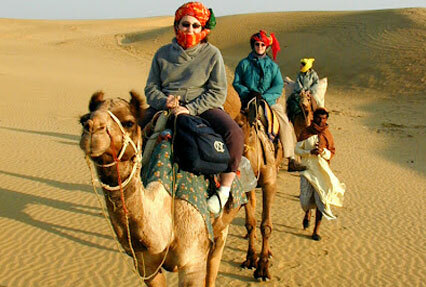 The offbeat destination or Rajasthan will give memories to be cherished forever. Head towards Ranakpur after relishing your breakfast. Upon arrival at Ranakpur, check-in at the hotel and relax for a while. Thereafter, you will be taken to the popular Jain Temple. Built-in 15th century, the temple consists of thousands of pillars that provide support to the several halls of the shrine. Interestingly, no two pillars are the same. Light colored marble has been used for constructing this grand temple. Reckoned as one of the seven wonders of India, the shrine is dedicated to the Rishabhanatha Tirthankara. The temple is also known as the Chaumukha Temple. Spend rest of the day at leisure. Hit the road to Devigarh in the morning. The small hamlet of Delwara housing the Devigarh Fort has a rich cultural heritage and offers abundant scope for sightseeing. After reaching the town, complete the check-in formalities at the hotel and unwind yourself., This is followed by exploring the major tourist attractions including Bapparawal Lake which is known for its beauty, Eklingji temple complex, a sacred pilgrimage of the Hindus dedicated to Lord Shiva and Nathdwara – a charming town which means the ‘Gateway of the Lord’. In the evening, visit Nagda, which boasts of a cluster of temples named as the Sahastra Bahu temple with alluring stone carving. The temple complex also features a beautiful Lilly pond adding to the beauty of the place. The holy abode of Lord Vishnu is now in partial ruins but exudes exemplary splendor. Eat your breakfast and embark on a city tour of Udaipur. Visit some of the major tourist hotspots covering the City Palace Museum – built over four decades, the palace is a jewel in the crown of the city. Take a time travel into history and experience the royal lifestyle of the rulers of the past. Sahelion Ki Bari is a major garden with kiosks, fountains, and marble elephants etc. which presents a visual retreat. Bhartiya Lok Kala Manda is a cultural institution to promote Rajasthani folk articles and Jagdish temple, a large Hindu temple amidst Udaipur just outside a royal palace are other best places to visit in Udaipur. In the evening visit the grand City Palace on the banks of the lake along with the Monsoon Palace – a palace which was constructed to keep a check on the monsoon clouds. After the visit, return to the hotel for a sumptuous dinner and an overnight stay. Post your breakfast, get transferred to Dungarpur. Located near Rajasthan – Gujarat border, Dungarpur is a quaint tribal hamlet. Royal residences and palaces bring much of the fame for the village. The town is also known for its green marble which is found here in abundance. On reaching, get accommodated at one of our listed hotels. The major tourist attraction of Dungarpur includes Juna Mahal – a seven-storeyed edifice which shows a striking resemblance to a citadel. Also, the palace has been elaborately planned and features miniature paintings and beautiful murals. Shrinathji temple is another best place to visit. Housing spellbinding idols of the Radhika ji and Goverdhan Nathji, the temple is frequented by devotees of Lord Krishna. Next on the list is Udai Bilas Palace which is designed in classic Rajputana architectural style. Next morning after breakfast drive to Bijapur. The ancient city is famous for the Gol Gumbaj and other historical monuments. Stop midway to visit the Chittorgarh Fort. After reaching, visit the Chittorgarh Fort, the most important site of the town. Titled as the UNESCO World Heritage Site, the fort is an epitome of the Rajput grandeur and chivalry. Post excursion to the palace, move out for a sightseeing tour of the major tourist attractions of Chittorgarh covering Fateh Prakash Palace which is meticulously preserved for the discerning visitors, Archaeological Museum, Kumbha Shyam temple, Kalika Mata temple and the Tulja Bhawani temple. After the visit resume with drive to Bijapur, a base for the Meena tribes, where you will get a wonderful opportunity to understand their culture and tradition. Reach Kota by road after relishing your breakfast. Upon arrival at Kota, check-in at one of our listed hotels. Relax for a while and then proceed for a sightseeing tour. The town is well-known for its palaces, unique style of paintings, places of worship and museums. The major tourist attractions of Kota are Chambal Garden which is one of the most beautiful picnic spots in India in the lap of exquisite greenery, Maharao Madho Singh Museum – a museum with an amazing collection of Rajput miniature paintings and Kota Barrage – a water reservoir with a splendid view of water flowing through gates. Other attractions are the Government Museum, Jag Mandir Palace – a fascinating palace situated amidst the Kishore Sagar Lake and Godavari Dham Temple. Spend the night at the hotel in Kota. Savor hearty breakfast and drive to Bundi. As you reach, check-in at the pre-decided hotel. Also known as the ‘City of Wells’, Bundi is another unexplored gem of Rajasthan. The place is so impressive that it inspired Rudyard Kipling to pen a part of his famous novel ‘Kim’ here. After straightening your back, enjoy a guided tour to the major tourist attractions of Bundi covering Taragarh fort – the most splendid structure paying tribute to the Rajput style, Bundi Palace, Chitra Mahal – a former garden palace and Rani Ji ki Baori – Queen’s Stepwell. Later visit Raj Mahal, a 300-year-old palace with the village named after it. In the evening, return to the hotel for a sumptuous dinner and an overnight stay. Start the day with a hearty breakfast. This is followed by a drive to Pachewar that is located at a distance of 90 km from Jaipur. Upon reaching, check-in at one of our listed hotels. After resting for a while, pay a visit to the well-preserved and tranquil Pachewar fort that has a massive rampart with imposing gates, intricate balconies and a rural backdrop. Later in the evening, take a leisurely walk to explore the nearby villages. Post breakfast, leave for Jaipur by road. Titled as the ‘Pink City’, Jaipur has its own charms. Upon arrival, check-in at one of our enlisted hotels. Later in the day, explore the major tourist attractions of the city including the Jal Mahal – an awe-inspiring palace amidst a scenic lake, Jaigarh Fort – known for housing the world’s largest cannon - Jaiban, Central Museum and Birla Mandir – a temple made up of white marble and which dominates the skyline of south Jaipur. Rest of the evening is to be spent leisurely. Hit the road to Bhandarej after munching your breakfast. The village has a lovely setting beside a lake and various settlements around it. Once known for its latticework, terracotta vessels and unique sculptures, the village is vibrant but forgotten. Upon reaching Bhandarej, get accommodated at one of our listed hotels. The village is also a haven for holidaymakers with activities like camel rides, horse rides and jeep safaris. After unwinding yourself, visit the Badrawati Palace. The palace showcases an excellent fusion of the Mughal and Rajput architectural style. The other tourist attractions are Baoli which is an architectural wonder of the bygone era and the Mehandipur Balaji temple. Savor delicious breakfast and then proceed to visit Karauli. This old princely state houses an old fort and several palaces that feature very attractive frescoes and lattice works. Upon reaching, check-in at one of our listed hotels. 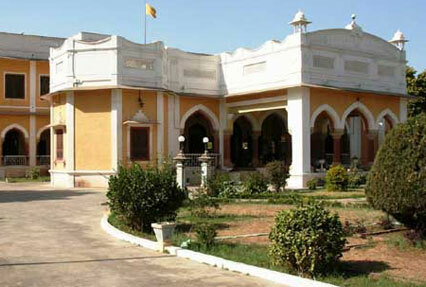 The major tourist attractions of Karauli are Bhanwar Vilas Palace – a palatial house partially transformed into a rich heritage hotel, Karauli City Palace – a revamped palace inspired from the Delhi style of architecture, Kaila Devi Sanctuary and the Timangarh Fort – overlooking the surroundings, the fort was named after the king Timanpal. Enjoy a leisurely morning. 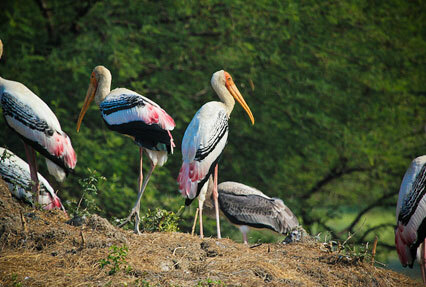 Thereafter, drive to Bharatpur, the city is known for its bird sanctuary, one of the best in India. Upon reaching, check-in at one of our listed hotels. After resting for a while, proceed to explore Keoladeo National Park - a famous avifauna sanctuary that hosts thousands of birds and the Lohagarh Fort – the fort which exudes an aura of rugged strength and has a breathtaking view of its mud bastions. You can also enjoy a rickshaw ride into the national park of Bharatpur being accompanied by a naturalist. This is the last day of the tour. After breakfast, drive straight to Delhi. On reaching, check-in at one of our listed hotels. Rest of the day is at your leisure. In the evening after snacks, get transferred to the Delhi airport to board a flight for onward journey.